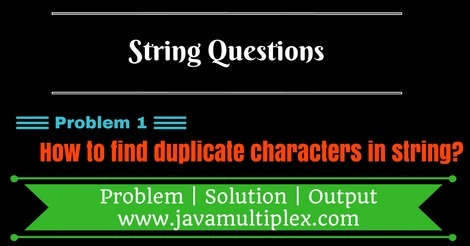 Home Difficult String Questions String Interview Questions How to find Duplicate characters in given String in Java? Write a program in Java that prints all duplicate characters in a String. For example "Java" has one duplicate character 'a'. We are using below steps for creating Java program. Convert original String to character Array. Remove all duplicate characters from String by converting String to Set. Get new String by converting Set (from Step 2) to String. Convert String (from Step 3) to character Array. If original String and new String are same then there is no duplicate character in original String otherwise go to Step 6. One by one check all characters of new String with Original String. If count > 1 it means duplicate characters present in String. // Converting String to char array. // Removing duplicates by converting char Array to Set. Output - Duplicate characters present in given String. Output - Duplicate characters not present in given String. Tags : Interview questions on String, Solution in Java, Duplicate characters, Iterator, HashSet, LinkedHashSet, for loop, while loop, if statement, char array, String functions. Can't we solve this problem in little simpler and short way. Because we have to just count the number of characters that are repeated. Can't we do it just using HashMap(). If we then the solution will become very small and easy to understand. We have to print duplicate characters in String. Yes, we can do this problem using HashMap() but I don't think so that is short and simple because we have to perform following steps. 1) Break string into characters. 2) Found the count corresponding to each character -> To achieve this we need nested loop. 3) Take character as a Key and character count as a value, then store it into HashMap(). 4) In HashMap() check for which Key , Value is greater than 1 and finally print Keys. I don't know the exact function name but I think we can do it in this manner. Rohit bhai appke hashset article mere interview clear me kaam aaya. Sir ji aapka bahut thanks.